Daniel Sturridge is scoring goals for fun this season and the Liverpool striker is a good bet at odds of 1.73 with Coral to rustle the onion bag versus Fulham at Anfield. Liverpool pumped Fulham home and away last season, winning 4-0 at Anfield before leaving Craven Cottage with maximum English Premier League points courtesy of a 3-1 away win. Fulham has managed to win two of its five English Premier League road matches this term but note that its victories came against a Sunderland side that was when in disarray under Paolo Di Canio and a Crystal Palace team that could end up being the worst in top-flight history. And remember that two of Fulham’s goals in its 4-1 win at Selhurst Park were strikes that will be goal-of-the-season contenders. The bottom line is that Fulham remains a genuine liability away from Craven Cottage, with its other road games across all competitions this season producing defeats to nil at Chelsea, Newcastle and Southampton, a 3-4 loss at Leicester and an extra-time 2-2 draw at Burton in which the Cottagers needed an 116th-minute equaliser to take the English Capital One Cup tie to a penalty shoot-out that they won. Rather than backing Liverpool at generally available odds of 1.25 to beat Fulham, take the bigger price about Sturridge scoring at least one goal for the Reds. 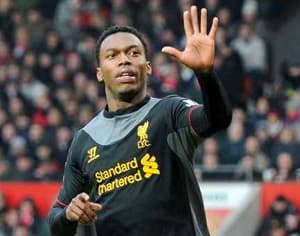 Sturridge bagged a hat-trick versus Fulham at Craven Cottage last term and he has scored 10 goals for Liverpool this season, including eight in the English Premier League. Sturridge has been on the scoresheet in nine of the 12 matches that he has played for Liverpool this term, with his blanks coming against Arsenal at the Emirates Stadium, Manchester United at Old Trafford and Southampton at Anfield – all top-half sides. Fulham has only kept two clean sheets from 13 games across all competitions this season so Liverpool, which looks set to mount a sustained English Premier League title challenge for the first time in years, should engineer plenty of opportunities for Sturridge to find the back of the net. Goals may not flow so freely in many other English Premier League matches, with the games at Selhurst Park and Villa Park very attractive from an exotic betting perspective. Of particular interest are punts on Everton to defeat Crystal Palace without conceding a goal and Aston Villa versus Cardiff to go under two and a half goals as well. That no manager worth his salt really wants to succeed Ian Holloway as Crystal Palace boss says it all. Crystal Palace is doomed to relegation from the English Premier League having scored only six goals in its 10 top-flight matches and losing its last seven elite games on the spin. Everton has lost only once in the English Premier League this term and its defence is among the best in the division. Everton is interesting at odds of 1.62 to win at Crystal Palace but be greedy and back the Toffees to accrue three points and keep a clean sheet at odds of 2.80 with Coral. Aston Villa’s English Premier League campaign has come off the rails after a promising start and, even though Christian Benteke has returned following a short break out due to injury, the Villans have failed to score in each of their last four top-flight matches. For the Villa Park game to have a good chance of going over two and a half goals one would have to fancy Aston Villa to score at least twice and, with Cardiff travelling to Birmingham off the back of its 1-0 South Wales Derby victory over Swansea, one would have to lean towards under two and a half goals strongly. Stan James is out of line in offering odds of 1.83 about Aston Villa and Cardiff combining for fewer than three goals. The English FA Cup first rounds takes place over the next few days and the pick of the bets in it is Cambridge to humble Bury at Gigg Lane. Cambridge, the Conference National leader, is trading at odds of 3.60 with BetVictor to beat a Bury team that is a good chance to swap places with it at the end of the season. Cambridge is performing to the level of a decent English League Two side so United really ought to be available at odds of around 2.75 to win on the road.